The Coast to Coast Air Ambulance mission is to provide safe, professional air medical transportation services, products, and systems with the highest level of quality and integrity. 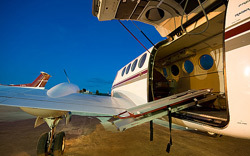 We are dedicated to providing excellent service to our customers, a fulfilling work environment for our staff, and responsible membership in the medical aviation community. We are an air ambulance company concerned about safety. We are FAA Certified for air ambulance service. We are an economical air ambulance service. We are a professional air ambulance service. We are courteous and caring air ambulance service.